FC Wisconsin continues to add to its coaching staff in preparation for the 2018-2019 season. The club is excited to announce that starting in June during the try-out process, Jesse Mosca will join the staff. Mosca will join the club having spent the last two years coaching at the Bavarian Soccer club within their U11-U12 Program. Jesse grew up playing for River Plate youth Academy in Buenos Aires, Argentina, but moved to the United States with his family in 1993 and played high school soccer in Woodland Hills California. After moving to the Wisconsin area in 1995 he has coached both boys and girls programs at multiple age levels at Mequon United since 2001. In 2010 he joined Grafton Soccer Club, which later became Fusion Soccer Club. In 2014 he became the Director of the Academy at Fusion Soccer Club and continued to oversee their youth program and Junior Academy teams. In 2016 Mosca joined the Bavarian Soccer club and helped with all teams within the U11-U12 Program. “We are excited to have someone of Jesse’s experience join our coaching staff. Jesse has a wealth of experience at working with a wide range of players at the younger ages and has proved to be an excellent developer of young talent. 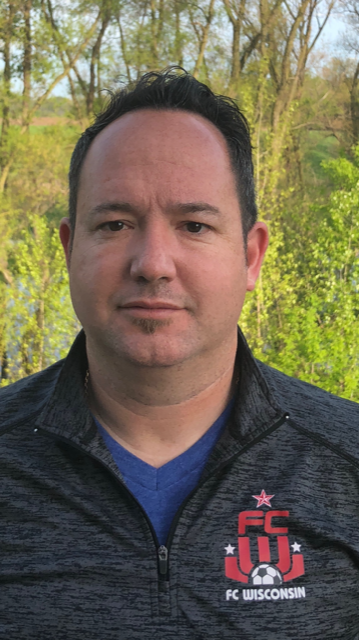 Along with current coaches Brent Behnke, and Jim McNamara we feel we have three excellent lead coaches within our U11-U12 Program that excel at developing young ambitious players to be successful at the older ages.” said Co-DOC Ben Shepherd. Mosca will primarily work within the FC Wisconsin U11-U12 Program, while also assisting with the Junior Academy Program. “Having had my eldest son in the FC Program this past year I have seen first hand how FC Wisconsin’s development philosophy is different from any other club in the State. The training environment, collaborative coaching model and culture is extremely unique and innovative which pushes players and coaches to reach their maximum potential. I am excited to become a part of the FC coaching staff and look forward to playing a part in helping develop players to play at the next level,” said Coach Mosca. “The hiring of Coach Mosca continues to show how seriously the club takes player development at all ages within all programs. As a club we are continually striving to improve and add quality coaches to our already elite staff. This highlights our continued commitment to true long-term player development for all players under the FC Wisconsin curriculum” said Co-DOC Billy Solberg. Welcome to the FC Family Jesse!